See QBRs as a secret weapon — a reason your region comes out on top quarter after quarter. Quick: What's the first thing that comes to mind when you think of your QBR? If you're a first-line manager, you probably remember being a rep. And that probably colors your answer. If you've experienced effective QBRs, your probably think pressure, commitment, and some drinking. If not, maybe you think paperwork, boredom ... and some drinking. Your QBRs sit squarely between annual kickoffs and weekly 1:1s. Planning, but grounded in deals. Strategic, but with measurable success in just 90 days. We want you and your reps to see QBRs as a secret weapon — a reason your region comes out on top quarter after quarter. 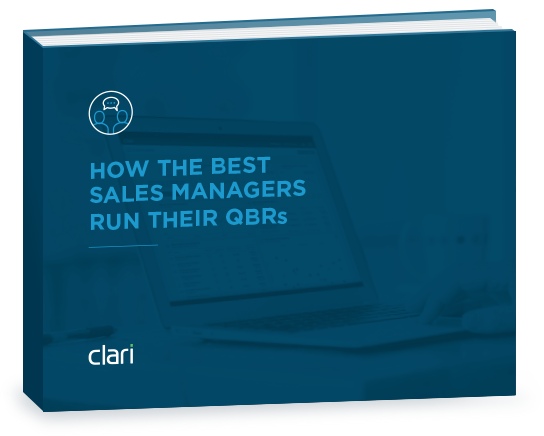 This eBook is what we’ve learned about making QBRs more effective — tailored to your management style. By submitting this form, you agree to the Clari Privacy Policies and Clari GDPR Agreement. © 2018 Clari. All rights reserved.